Traveling by umbrella has got to be one of the most uncomfortable modes of transportation ever. Think about it: there's no back support, you'll have hand cramps on long flights, all of your tops will have to be custom made because you'll build up some serious muscles in your umbrella arm but none in the other, and strangers are bound to come to you all the time asking if it's started raining outside because you're carrying an umbrella. So, when I heard that professional extreme athlete Erik Roner attempted to skydive with his umbrella ala Mary Popppins, I wondered what classic film transportation I'd use instead. Here's my list. Is your favorite on it? 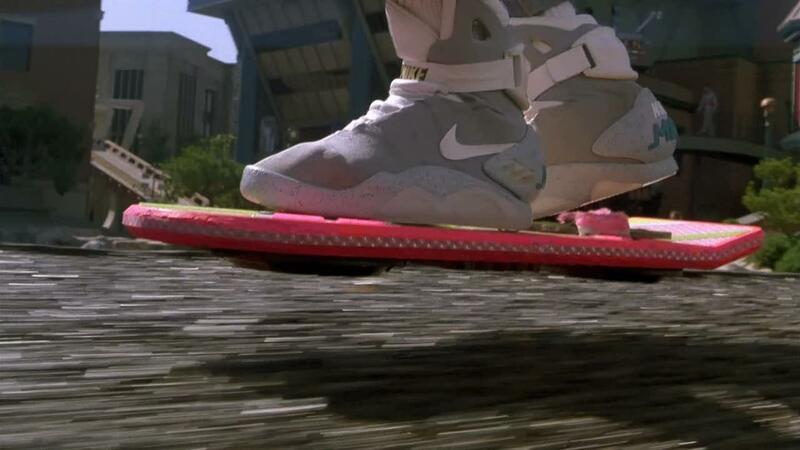 A hoverboard, duh. I figured we'd get the most obvious one out of the way first. But the Back to the Future II floating skateboard isn't without it's downsides. It doesn't work over water. 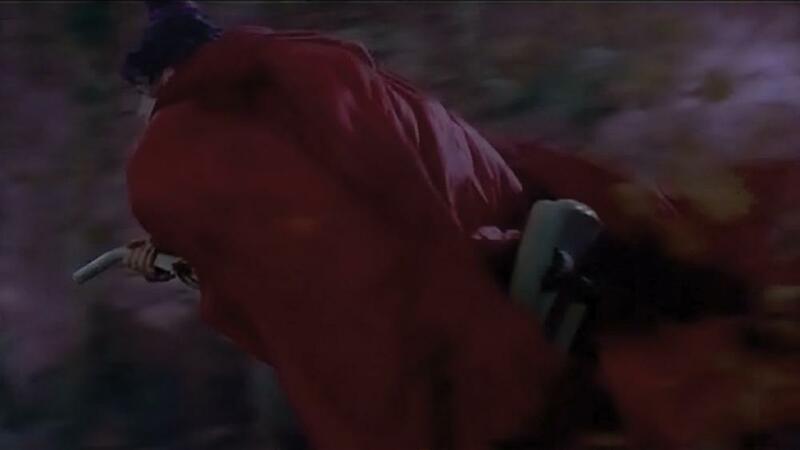 It's a little hard to see from this photo but that's witch Mary Sanderson from Hocus Pocus riding a vacuum. Why go with that versus a broom? Comfort. Riding around a broom has got to be seriously painful. The splinters alone would have my poor backside stinging. The vacuum with it's puffy bag and ergonomic handle is definitely the way to go. 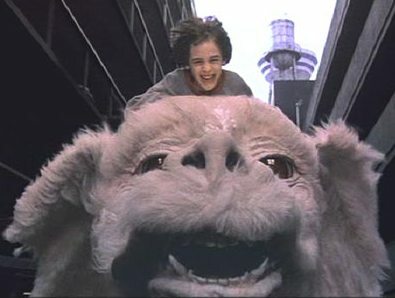 Ahhhh, the Neverending Story's luck dragon. There's no better way to see Fantasia than from Falcor's back. It's like seeing the world with your ginormous talking golden retriever. 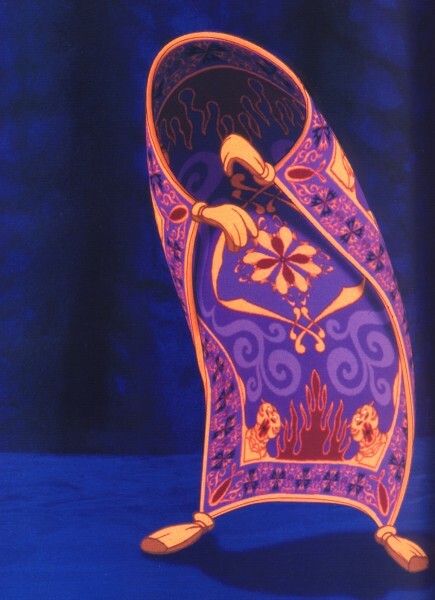 The rug from Aladdin is also a pretty choice way to travel. Sure, it has a bit of an attitude sometimes and there's always the problem with fraying but it's a classic. When you travel on a rug, you travel in style. 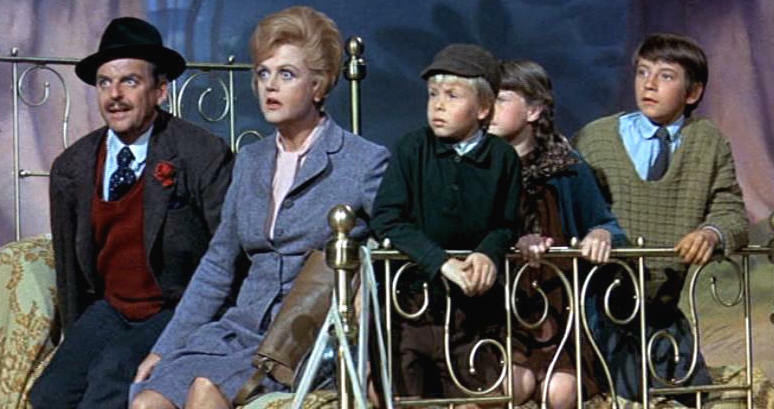 Of course, when you want to travel with a larger group of people, you'll want to choose the minivan of flying objects - a bed like that of Bedknobs and Broomsticks. Just whisper the incantation over the bedknob of a queen sized bed and you're good to go. Those modes of transportation aren't always feasible especially in inclement weather. 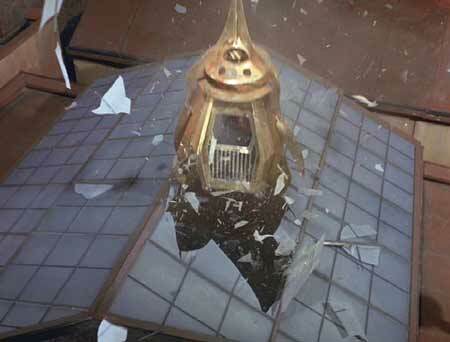 For times like these, I'd much rather have something like the glass elevator from Charlie and the Chocolate Factory. Why? Because it can go anywhere and comes with an unlimited supply of chocolate. Duh. OK. 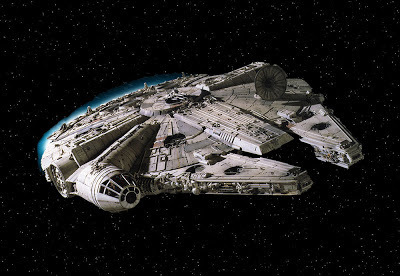 I probably should have listed the Millennium Falcon right after the hoverboard because this choice is pretty obvious. The Star Wars spaceship might be a hunk of junk but it's Han's hunk of junk and I adore it. 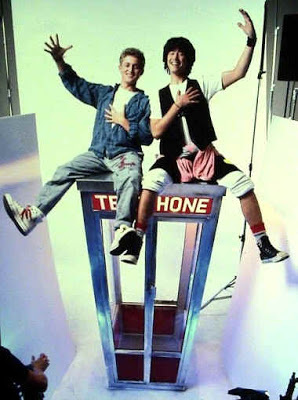 And finally, the phone booth from Bill & Ted's Excellent Adventure. The TARDIS doesn't qualify for this list as Doctor Who isn't a classic film, but this late 1980's ode to the traveling blue box certainly does. It may not be bigger on the inside, but those two nutty kids from San Dimas sure managed to shove enough people in there. So, how about you? 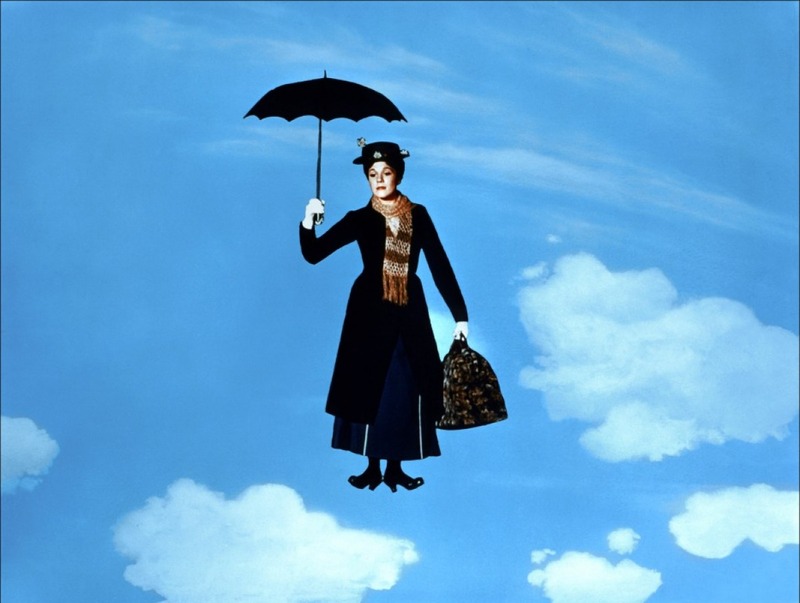 What mode of transportation from a classic movie would you go for over an umbrella? How about the car from Chitty Chitty Bang Bang? It flies, it floats, AND it rides on roads like normal car. and Speaking of normal cars with special powers, I would pick the Delorean from Back to the Future, because where we're going we don't need roads.